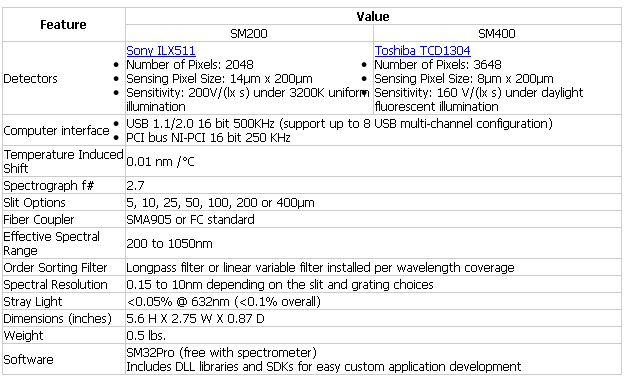 The SM240/SM440 is a compact CCD Spectrometer for use with a PC. 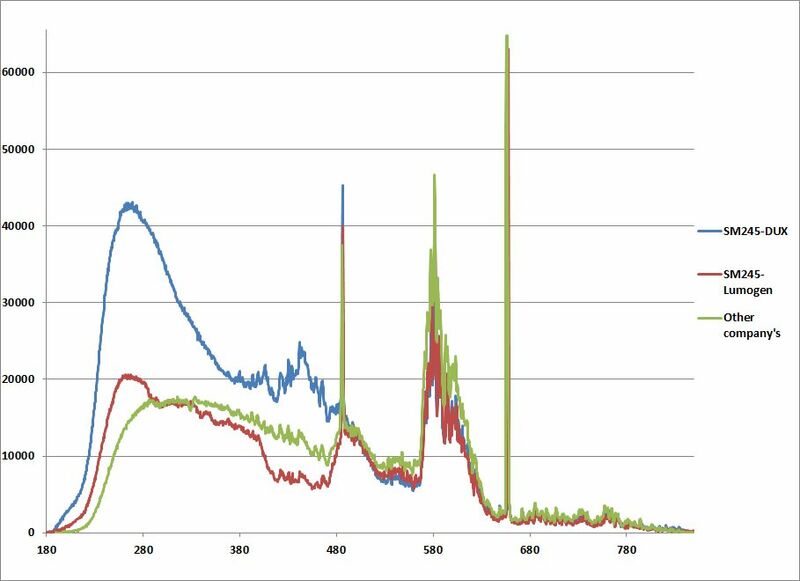 Based on the SM200/SM400 optical bench design, it supports many different applications where spectral or color measurements are required, including high dynamic range applications. The SM240/SM440 can accept light directly through its built-in slit or via optical fiber. The durable aluminum housing that encloses the SM240/SM440 provides stable optical bench operation over a wide range of temperatures. The standard sensor arrays used are the Sony ILX 511 for SM240 and the Toshiba TCD1304 for the SM440. The array driver electronics have been designed for highly sensitive yet stable operation. These arrays (in conjunction with our special UV coating process and custom order sorting filters) allow up to a 850nm measurement window located from 200nm to 1050nm (smaller measurement window sizes increase spectral resolution and light sensitivity). Standard interfaces to the SM240/SM440 include a USB 2.0 interface and a PCI card interface with 16-bit dynamic range. Our USB board can support multichannel configuration up to 8. With this multichannel configuration, a high resolution for wide range or a dual spectrometer system (one for measurement and the other for reference) is possible. The black-anodized housing is available for OEM customers who are using the unit as it is with no need to install the optical bench and the electronic board separately (like SM200/SM400) in their systems. The electronic board is secured in the housing of the SM240/SM440, which is better for the electronic noise protection.